Dr. Maria Blanco ( UPM) and Iñigo Capellan ( PhD Student, Fundación Repsol Scholarship ) were interviewed in “La mecanica del Caracol” ,Radio Euskadi, during the workshop organized by the Low Carbon Programme entitled “Biofuel Policy for a Low Carbon Future”, that was held in Bilbao on the 19th of September. Transport is a very important sector in the transition to a low carbon Europe. Transport uses a third of all EU energy and is responsible for 25% of the European GHG emissions. Moreover, it is the only major EU sector where GHG emissions are increasing. This has made the European Commission to set for 2050 an 80% reduction of carbon emissions in transport and 70% reduction in the use of oil. Achieving these ambitious targets will require a complex set of means including the reduction in scale (demand of transport), improved technology (increase the efficiency in vehicle’s engines) as well as a change in the fuel mix. It is in this latter aspect where biofuels are expected to play a significant role. 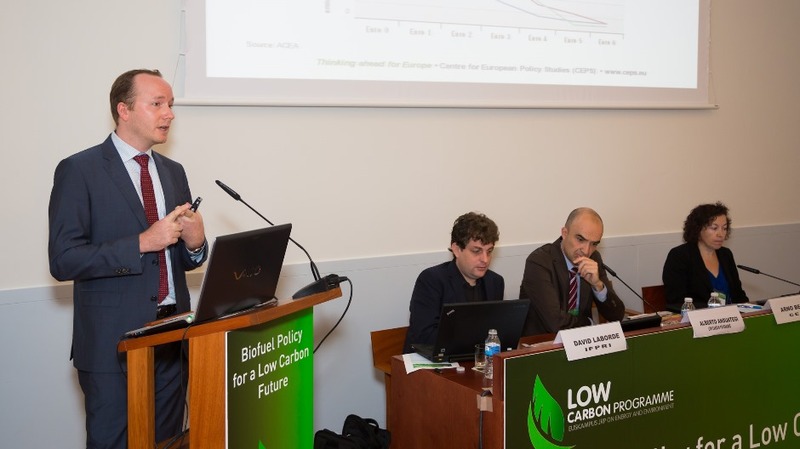 Thus, the first presentation this morning, by Arno Behrens from the Centre for European Policy Studies will focus on the role of biofuels in the objective to achieve a Low Carbon Transport in Europe. The workshop will have two presentations that will deal with two of the major concerns raised in the last decade regarding policies promoting the use of biofuels. The first concern is about changes in land use caused by the increased demand for biomass. Considering these indirect land use changes we may find that some biofuels can actually lead to higher carbon emissions than fossil fuels. Dr David Laborde, from IFPRI, will explain the science behind indirect land use changes in a moment where the biofuels industry is continuosly disputing it. The second concern has to do with the impact of biofuel policies on agricultural price levels and volatility and María Blanco, Associate Professor at the Universidad Politécnica de Madrid will deal with the fuel versus food debate. The topic will be approached from ohter three new perspectives. First of all, Dr. Thonier, from Bio Intelligence, a consultancy firm based in Paris, will share some details of a set of projects that BIO IS is carrying out for the European Commission and the French Department of Agriculture and will motivate the need to introduce flexibility into biofuel mandates. Next, Nusa Urbancic, clean fuels manager at environmental NGO Transport and Environment will share their reflections on how to fix EU biofuels policy. Finally, Carlos Díaz, from Repsol will provide us with an oil company’s view on biofuels mandates. The International Center for Climate Governance (ICCG), is pleased to announce the winners of the 2012 ICCG Climate Think Tank Ranking, the first ranking of think tanks working in the field of climate change economics and policy. in the Global category: the Belfer Center for Science and international Affairs, founded in 1973 in Cambridge, MA, USA, with its Environment and Natural Resources Program. This is the first edition of the ICCG Climate Think Tank Ranking, which has assessed a selection of the main think tanks included in the Think Tank Map observatory as of December, 2012. The indicators are based on the criteria of per capita productivity for each think tank and have been carefully selected since 2012 when specific weights were assigned according to the feedback provided by experts in the field. The two categories differ by the number and type of assessment criteria: the criteria in the Global ranking are a subset of those in the European ranking. Therefore, the Global category does not encompass EU think tanks, which have two additional indicators (the number of EU projects and participation in the EU consultation process). About the Think Tank Map The Think Tank Map observatory , a project developed by the International Center for Climate Governance (ICCG) , was launched in 2011 as an instrument to provide a complete overview of active think tanks in the field of climate change economics and policy. The Think Tank Map is currently composed of 275 think tanks worldwide. The Think Tank Map is not only a showcase for every organization working on climate change economics and policy, but it is also a catalyst for new cooperation opportunities, allowing stakeholders, researchers, institutions, and the media to be informed on all the relevant activities and to engage in mutually beneficial partnerships.